Ara Hakobyan has been named Football Player of the Year by a poll of Armenian journalists, coaches and referees. The FC Banants striker scored a record 45 goals this season among which were nine hat-tricks, one four-goal and one five-goal haul. He was also named the best forward of the year. Pyunic's Apoula Edima Edel Bete was named the Best Goalkeeper. Best Defender was awarded to Khose Bilibio while Levon Pachajyan became the Best Midfielder. Second and third places for Player of the Year went to Edgar Manucharyan of Pyunic and Edel Bete. 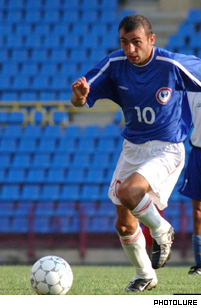 Manucharyan was also voted "discovery of the season" scoring 12 goals in 17 matches for the 2003 season champions. FIFA has released its ranking of national football teams for November 2003. Armenia currently holds 112th place (out of 204) in the world with 411 points. In Europe Armenia is 43rd among 52 countries. The women's national football team of Armenia is 83rd with 1214 points among 113 countries in the world.